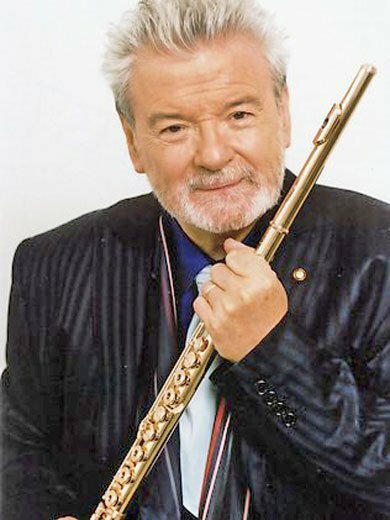 By happy coincidence (perhaps), the advent of spring virtually coincided with a fresh, revitalizing Celebrity Series recital by Sir James Galway at Symphony Hall on Sunday. It was easy to see why Galway is one of the superstars of classical music: the expressivity and virtuosity of his playing remain formidable, and his witty addresses to the audience informed as well as charmed us. Moreover, he particularly reaches out to young people in an effort to enlarge the audience for classical music, especially flute music, naturally. Welcoming the children in the hall, he held up his flute and said, “This is an airline ticket to all the great places in the world.” Nor did he forget to allude to the several world-renowned flute-makers based in Boston. Galway commenced with Wolfgang Amadè Mozart’s Flute Quartet in D Major, K. 285. In a deft collaboration with the Galway Chamber Players—Arianna Warsaw-Fan, violin, Laura Lutzke, violin, Philip Kramp, viola, and Meta Weiss, cello—Galway’s effervescence and range of color and articulation were mirrored by elegant and responsive string playing. The plangent slow movement evoked a moonlight serenade: the flute sang touchingly over the pizzicato strings portraying a mandolin or lute. The final Rondo was a breath of spring air, full of irrepressible high spirits. For a composer who gave the flute many gorgeous moments in orchestral literature, Claude Debussy gave it surprisingly little chamber repertoire. For this reason many flutists have felt free to borrow from his numerous piano works. Clair de lune seems an obvious choice simply for its great popularity, but I for one find it to be gilding the lily, especially when the flute simply doubles the melody line virtually the whole time. It also exposed a couple instances of imperfect intonation on this occasion. Nonetheless, there were also some moments of great beauty when the audience’s enchantment was palpable, due in equal measure to the gently beguiling playing of pianist Michael McHale. Sir James was joined by Lady Jeanne Galway for the Fantasy on Verdi’s Rigoletto for two flutes and piano by the Doppler brothers, Franz and Karl. Naturally, the theme that got the most exposure was Caro nome, for which Verdi had originally featured the flutes alongside the soprano. By the end, the Dopplers even managed the neat trick of putting the famous theme into a waltz rhythm. The Galways and McHale contributed a fine performance, memorable for both graceful rubato and stereophonic technical display. Continuing in the operatic vein, Galway and McHale played François Borne’s Fantaisie brillante on themes from Bizet’s Carmen, arranged by Galway. He demonstrated an effective mix of delicacy and vigor, seduction and display. The famous Habanera was by turns slinky, tender, and teasing. Ultimately, of course, the piece ended with brilliant flute fireworks. Opening the second half, the Galway Chamber Players rejoined Sir James with an additional member, double bassist Judith Sugarman. There were two French works, François-Joseph Gossec’s Tambourin and Marin Marais’s Le Basque from Five Old French Dances. The first, taken from the populist opera Le Triomphe de la République, was played with impish fun. The second, an arrangement of a piece for viols and accompanied by pizzicato strings, had a jaunty charm. Irish composer Hamilton Harty is known for his songs, and his In Ireland fantasy for flute and piano is a close relative of them. Based on a number of folk-tunes, it needs an ineffable singing quality. This, of course, is what Galway is famous for, and we heard a bewitching mixture of songs without words and rhythmically infectious dances. The spell continued in the group of three Irish folk songs, arranged by David Overton. Galway was rejoined by the five string players for the songs Spinning Wheel, “She moved through the fair,” and “Star of the County Down.” The middle song’s tune was familiar to me even if the title was not, in a beautifully dreamy performance like a languid August afternoon. Gorgeous and striking, too, was its “funneling down” as the lower strings dropped out successively, leaving just the first violin with the flute, and finally the flute alone. French jazz pianist Claude Bolling paid tribute to Ireland with the Irlandaise movement of his Suite for Flute and Jazz Piano. Galway and McHale convincingly traveled beyond the classical repertoire in this piece which alternates gently swinging rhythms with long-breathed legato melody. In piano solos McHale created his own riffs, not slavishly following what the composer does in his famous recording with Jean-Pierre Rampal. Galway’s friend, the late Henry Mancini, loved to play the flute; accordingly, the former principal flautist of the Berlin Philharmonic taught his composer friend to play the penny whistle as well. Perhaps in gratitude Mancini wrote “Pennywhistle Jig.” Playing it here with rollicking panache, Sir James was an irresistible Celtic Pied Piper. The program proper concluded merrily with Mancini’s “Baby Elephant Walk,” also on the penny whistle. Galway enjoyed bending the pitch bluesily from time to time and paid tribute to his friend by having the audience shout, “Henry!” in several rhythmically appropriate places. The first encore was a simple arrangement of “Danny Boy” with the chamber players, deeply moving to Irish and non-Irish alike. Breaking with concert orthodoxy, Sir James left the second encore to his pianist. Michael McHale’s Schubert: Impromptu in E-flat was expressive and responsive to its unexpected harmonic shifts, and the right-hand fingerwork would have sparkled but for overly generous pedaling. Finally, Lady Galway was recalled to the stage to play with her husband a two-flute and strings arrangement of “Shenandoah,” enjoyable for its semi-sweet harmonies and gentle interplay of the two flutes, though the arrangement’s book-ending with the famous opening chords of Dvorak’s “New World” Symphony slow movement was a rather peculiar and, to me, unconvincing feature. This recital was billed as being part of Galway’s “Legacy Tour,” which sounds uncomfortably close to a farewell tour. With the flutist still at the top of his game, it would be a pity to bid him farewell. I hope as well that he has a special desire to return to Boston, home to so many Irish Americans and to Nagahara Flutes, the company that created the gold flute he plays so bewitchingly. Sorry I missed it. Sounded like a great recital. Thanks for the review !